Thanksgiving is one of my favorite holidays because it is focused on family and food. There is no worry about getting the best gifts for family members it is just focused on spending time together and making food together. It is not just the time of the actual dinner, but it reminds me of the memories of waking up to my mom preparing the turkey early in the day, my dad making monkey bread for breakfast and mashing the best potatoes, watching the Thanksgiving Day parade with my sisters and parents. It was a whole day event preparing food together and making memories. Over the last ten years or so we have added a new tradition to the family meal where we take a moment to share something we are grateful for. I love it. I don’t know why it took us so long to start this, but I am happy we did. I love hearing the unique things that my family shares and reminds us of the important things. Let’s be honest, practicing gratitude is not always the easiest, especially around the holidays. Things get chaotic and we over extend ourselves. It just picks up; there are holiday parties, multiple families to see, stressing about gifts for family and friends, overspending and just all the other stressors. It is in these times we should be taking the time to practice gratitude as it reframes our focus and adjusts our perspective to the important parts of life. The benefits of practicing gratitude are far more than one person can list. A grateful attitude, even for the small things, can help decrease anxiety and expand your ability to find different solutions. Practicing gratitude allows you to take a second to see things through a different perspective, and a good one at that. It increases happiness in life. Practicing gratitude isn’t something that comes naturally. It will take some work and discipline, but it is worth it. People who practice gratitude notice a perspective change and share they are happier. 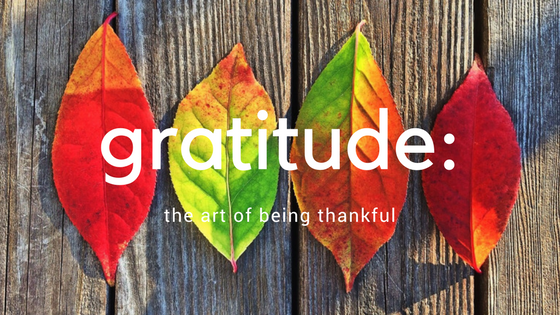 So how can you practice gratitude throughout your day? Stop and smell the roses! Taking a second to recognize the beauty of something in nature is a good way to practice gratitude. You can thank your cashier or barista, even take it a step further and acknowledge them by their name (notice how that changes things). Take a moment at dinnertime to share your moments of gratitude in the day. Incorporating this with little ones will benefit them long term. You can start a gratitude journal. At the end of each day, take a moment to write in a gratitude journal. If daily seems to be too much try a couple times a week; you will still see the difference. Show your gratitude by thanking your significant others, kids, friends or even coworkers. Take a few moments in your day to write down at least one thing you are grateful for. 2. Choose the best time for you. Find a time that works best for you. This will help it be truly incorporated into your routine. This is pretty basic, but difficult. It takes time to develop a habit. Commit to practicing gratitude. If you forget one day, don’t give up, try again the next day. 4. Be vocal about it. Share your practice with others. Tell people how you are practicing gratitude. Add it to your family dinner. Ask each family member share one thing they are grateful for in the day. This not only fosters identifying the positive in your life, but also encourages it in your family. Once you see results, don’t stop. Keep the habit going. It has made a positive impact in your life, why would you want to stop now? If you miss a day, don’t fret! Start again the next day. There will be days that it will be harder, understand that, but also push yourself to see if you can find one thing…even if it is just being home and getting to go to sleep to start another day. Studies have shown that there are multiple benefits to keeping a gratitude journal. The study showed that people exercised more regularly, felt better physically, had a better perspective on life as a whole, and had a more optimistic mindset. It also concluded that people who kept a gratitude journal were more likely to make progress toward their goals. Overall, there was a greater sense of feeling connected to a community, feeling more positive and even better sleep. Wouldn’t it be a great thing to add some of this to your life just by practicing gratitude daily? I challenge you to try adding one of these practices to your life and see how it impacts other areas or even other people you encounter. When you take time to be grateful, the positive will grow from within and it will be a gift you share with others. It is contagious.